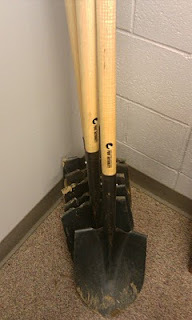 In 2004, the Port Authority invested in some nice, clean shovels to use in groundbreaking ceremonies. We got to use them the first time for a groundbreaking for our first road extension in late 2004. We used them for a building for Canadian-headquartered Samuel Manu-Tech in 2006. We used them for two more roadway projects, including our last one where we broke ground in the snow in January 2009. We, even, loaned the shovels out for a groundbreaking on an industrial site project in Western Licking County in late 2009. Yesterday, the shovels got their use for a groundbreaking for our new office and clean room building for which Goodrich has agreed to lease the first floor. It's good to have well-used groundbreaking shovels. Here's hoping we get to use them again and again.